Prepare marinade for the chicken fillets: mix olive oil with salt, pepper, thyme and red paprika. Spread the marinade over the meat and let marinate for a couple of minutes, or ideally, overnight. Heat a pan, then add the chicken fillets and cook until golden brown. Turn over and cook on the other side as well. When cooked, remove from pan and let the meat rest for about 10 minutes, then cut into strips. Prepare Mustard Dressing: place ingredients in a jar with a lid, close the lid and shake the jar well, until all the ingredients combine into a golden emulsion. Wash and dry baby spinach, romaine hearts and strawberries. Slice strawberries and remove stems. Peel onion and slice thinly. Place vegetables into salad bowls. 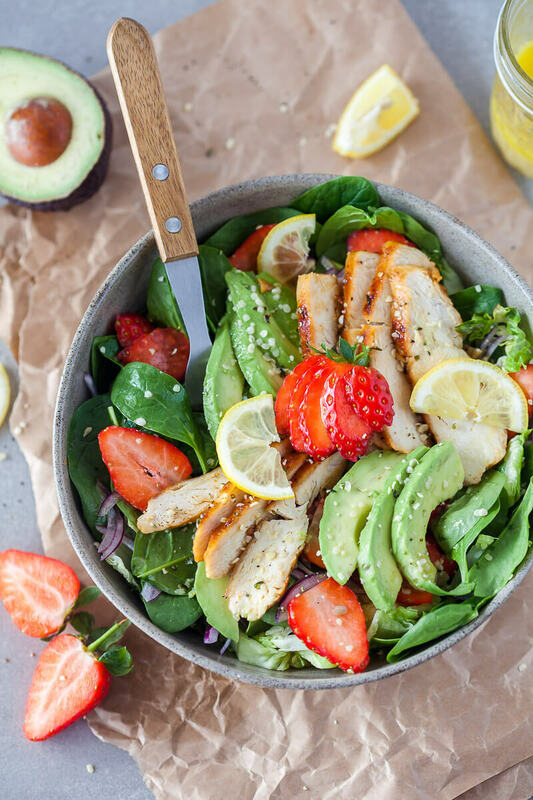 Top with chicken and avocado slices. Add some sunflower seeds and hemp seeds, and pour over the mustard dressing. Mix well to combine and serve.